Members of Congress have only been sworn in a mere six months, but a slew of challengers have begun their campaigns for the 2018 midterm election. Speaker of the House Paul Ryan’s Democrat challenger has already announced for Wisconsin’s first district, and launched a You Tube video that has received much attention. Closer to home, Austin’s Lamar Smith (TX 21) has earned himself at least four Democrat aspirants for the nomination to oppose him. Neither appears to have drawn a challenger in his own primary as of yet. But Houston’s John Culberson (TX 7) has already acquired a primary challenger, health care executive David Balat. 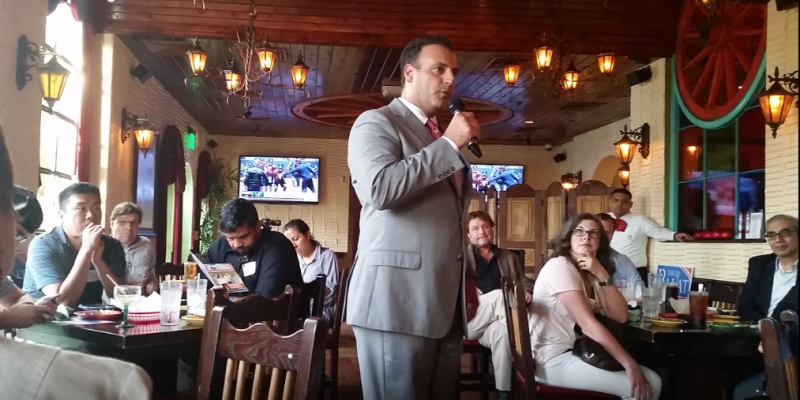 Balat has begun visiting local groups and introducing his campaign to Republicans in the district, most recently hosting a meet and greet event at El Tiempo Cantina on Gessner. The crowd in attendance included several district Republican precinct chairs getting their first look at the candidate. Born in Houston to immigrants who owned their own business, Balat attended the University of Houston, started his own businesses in town, and is raising his two children in the Meyerland area with Lauren, his wife of twenty-one years. He noted that most people in Houston have connections to the energy-sector and that the district is the heart of the energy capital of the world. The current representative, he claims, is ignoring the concerns and pain points of energy executives, instead of creating conditions to contribute to their success. He also charged current Republican officeholders with layering taxes upon taxes, stifling economic growth for the area and the country. Balat told the crowd he feels called to run and to take his skill set from the health care industry and the business world to bring some of that discipline to Congress. His campaign hashtag #ArmyOfDavids reflects his understanding of the challenges facing him both in his campaign now, and in serving in Congress should he win. As he worked the room, talking individually to the voters who came to hear from him and evaluate him, he listened to their concerns, and also hoped to recruit them into that army. He knows he will need them in the long campaign season ahead, and isn’t wasting any time. His campaign is working to get in front of as many people as possible from the district who feel, as he does, that it is time for new leadership in District 7. This isn’t the first primary challenger the congressman has faced. Culberson faced challenges in the 2016 and 2012 primaries, hanging on to the nomination with 86% in a two-way race in 2012, but netting only 57% in a three-way race last year. Additionally, the district voted for Hillary Clinton instead of Trump in the 2016 election, something that both Democrats and Balat believe may play to their advantage. To learn more about David Balat for Congress, you can visit the campaign website, Twitter, and Facebook.